The Alabama Theatre and the River Oaks Theatre; the two go hand in hand. Both were built in 1939, less than a month apart. The River Oaks film schedule, 1980. 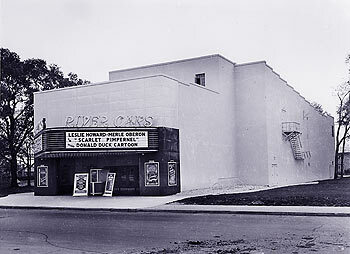 Originally an independent theatre, the River Oaks was opened to the public on November 28, 1939, with the feature, Bachelor Mother. It was acquired by the Interstate theatre chain in February 1947, and became an early art house, featuring foreign and stateside films for one-week runs. Interstate held on to the River Oaks for close to three decades, finally relinquishing it in late 1975. It was taken over by Trans-Continental, a chain that operated the Shamrock Six and Festival Six multicinemas. It was then acquired in 1977 by Movie, Inc., a repertory theatre chain out of New Mexico. Movie, Inc. eventually merged with the Los Angeles based Landmark Theatre Company. The River Oaks flourished during this pre-videotape era as a reperatory house, with old movies, re-released movies, classic movies, foreign movies, cult movies, and most anything out of the mainstream. 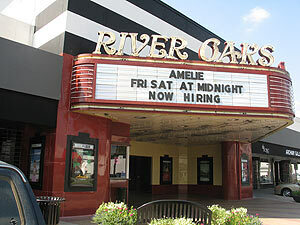 The River Oaks successfully managed to survive in the era of the megaplex, and is considered to be the premiere spot in the city for the astute filmgoer. In July 22, 2006, front page of the Houston Chronicle detailed unconfirmed plans to raze portions of the River Oaks Shopping Center (including the River Oaks Theatre), and a multistory Barnes & Noble would be constructed where the Black-Eyed Pea restaurant stood, thus making the Alabama Bookstop (operated by Barnes & Noble, and located a few miles away from the River Oaks theatre) obsolete. Efforts have since been made by various local groups to save these structures, including an August 1, 2006 appeal to Houston City Council, and a petition drive. Society philanthropist Carolyn Farb spearheaded a preservation effort in front of the River Oaks Theatre on August 30, with a crowd of supporters wearing black Save Our Shrines T-shirts. As expected, the Alabama Bookstop was closed. As of this writing, the River Oaks Theatre is still operational. For links to media coverage on the Alabama and River Oaks theatres, click here. 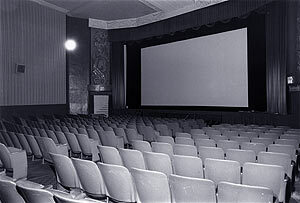 The main auditorium of the River Oaks in 1986.